This morning we woke up early for two reasons. Firstly because I had a nightmare about causing a young child to choke on a goji berry but more importantly because we heard about a local farmer's market which we hoped would replace our beloved former farm share. The market was pretty nice. 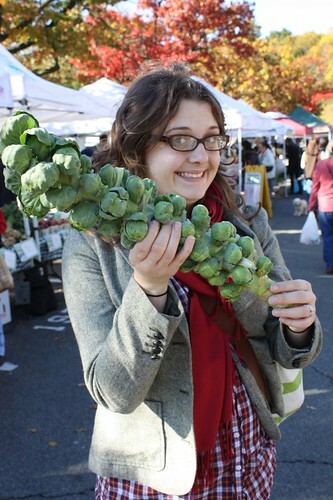 We got some cider, cider donuts, some bread, and these fantastic brussel sprouts which Jen is brandishing like an Uruk-hai warrior. By the way, this is about the tenth time we've seen this vehicle downtown. Yes, that's a toilet on the roof. Yes, it claims to be called "The Floatie Mobile." 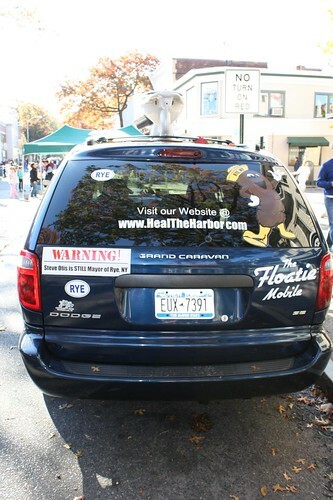 And, yes, there is what appears to be a turd wearing a jaunty sailor's cap on it. 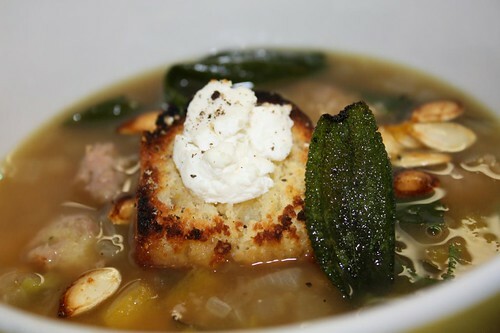 Despite the unappealing vehicles I decided to turn our stuffed pumpkin leftovers into this soup. I sauteed some garlic, onion, and the remaining fennel along with the last bit of acorn squash from the farm share. I added in some of the leftover sausage cornbread stuffing and last week's turkey stock. I toasted the remaining cornbread slices with some goat cheese, toasted the pumpkin seeds with some chili and cumin, and fried up some whole sage leaves for garnish. 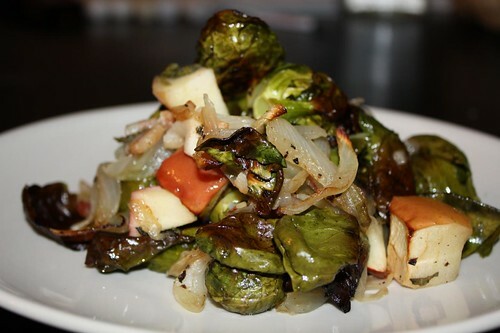 As an accompaniment: roasted brussel sprouts with bacon, apple, vidalia onion, and sage. Now we only need to find room in the freezer to fit the remaining turkey stock. And room in the garbage for the brussel sprout stalk.